Pioneers in the industry, we offer a3 creasing machine and a2 brochure creasing machine from India. 'AJAY' Make Single line A3 Size brochure creasing machine for making folding lines for brochures, Pamplets , Greeting cards ,etc. 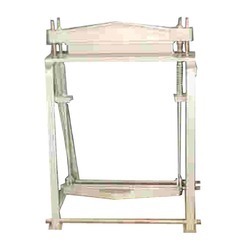 Foot operated machine with Creasing die set , Guides and Wooden Platform. Ideal machine for any printing press, Xerox shop. 'AJAY' Make A2 ( 24" ) brochure creasing machine for making folding lines for brochures, pamplets, greeting cards. With Creasing die, Guides and wooden platform. Looking for Creasing Scoring Machine ?